Umi, a shy teenaged girl, manages a boarding house on the Yokohama seaside. Her father was killed in the war and her mother travels constantly, so in addition to attending high school, Umi must also run the family business. Her classmate Shun, an orphan unsure of his lineage, lives with a few other students in the old high-school clubhouse, a French-style, mansion that’s set to be demolished as part of the current modernization project. Shun and his schoolmates refuse to let this happen. 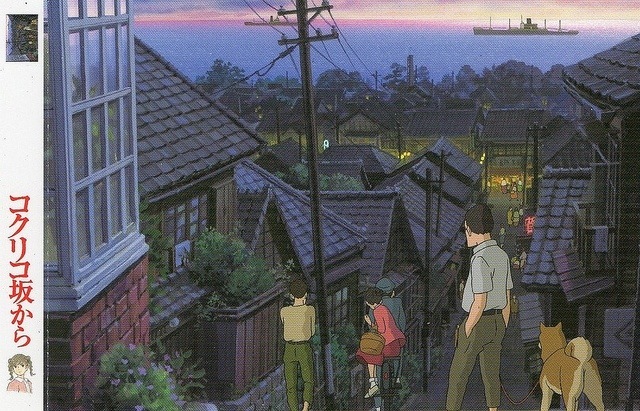 I obviously watched this movie because its a Ghibli production. 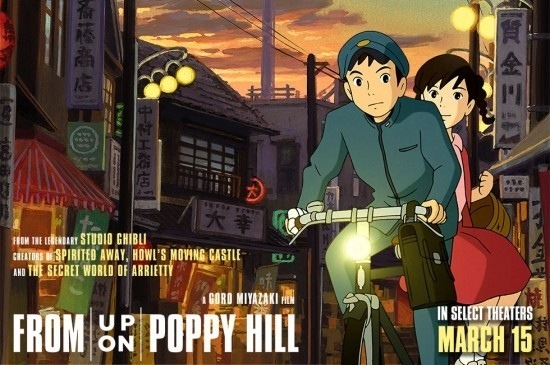 From up on poppy hill‘s poster looked simple to whisper of the heart‘s poster, so I had my hopes up but I shouldn’t have. The movie was nice but it wasn’t what I hoped. The art was pretty cool so were the characters. I liked the events in the story, like how they worked on the building and stuff. That was the only highlight in the movie, I guess. The movie had a sort of a happy ending, but I wasn’t crazed about it. It’s a beautiful story, but it isn’t amazing.